Nominet (Board Elections 2014) and Transparency? I need some urgent advice from the community.. am I thinking along the right lines? Please do write your comments here on the blog, or on Facebook/Twitter/LinkedIn/Google+ if you see the posting there. You may, if you wish, contact Nominet about your feedback directly (but please do make sure you copy me in on what you write to them). Also note that if you wish to change your vote (or assign a new proxy) after reading (and investigating) this, then you may do so as Popularis (the election scrutineer) do allow this although you will need to do this by early next week. The Nominet AGM takes place on Wednesday 21 May (next week) and if you wish to change your vote or do wish to vote, or raise any concerns with Nominet and/or the election scrutineer, Popularis, then you need to do this ASAP. 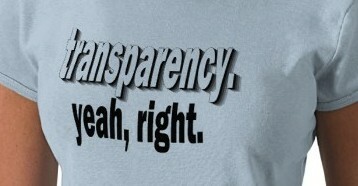 Transparency, is important to me. So are fair elections. However it seems that Nominet (via it’s Senior Legal Counsel, Nick Wenban-Smith) do not believe in such… especially when it relates to the current Board election and one of the candidates… and this is where I would like your opinion and thoughts. It is very hard to stay away from conflicts of interest in this industry. What is important is how we deal with those conflicts of interest. However when one is asked to disclose these, I do believe there should be no omissions. Further, if any such omissions are brought to the attention of the company running the election, I believe they should take appropriate action, regardless of who it relates to (whether a recommended candidate or not). As a brief explanation, I noticed a glaring and significant omission in one of the candidate ‘Statement of Interests’ (a statement to show the voters where any conflicts do or may arise) – that belonging to Oliver Hope. I reported this to Nominet, yet they continually refuse to do anything about it. What is the significant and glaring omission? The fact that the company Oliver is a Director of and has significant influence in, is a large supplier of services to Nominet. [Nominet Question] B. The Nominet Board places a high degree of importance on each director being able to exercise independent judgement, free from any conflicts of interest. Please describe how you would be able to fulfil your duties in the light of your involvement in the domain name industry or your other commercial interests. [Oliver Hope’s answer] I would not be conflicted on the board. I work for a domain name registrar, but I demonstrate independent judgement in all my governance work. As a chartered accountant I remain independent and audited by profession. I believe in the principles of transparency and equality. As a member of the ExCom of the RrSG I must regularly act in the best interests of the overall group, not allowing any conflicts to interrupt the best course of action for the wider membership. I have a long ongoing email exchange (since the end of April) with Nominet’s Senior Legal Counsel, Nick Wenban-Smith. Nick refuses to see Oliver’s omission as any problem. The reason? He claims the news about Mesh Digital Limited (Domainbox) supplying services to Nominet is public anyway (if you go looking for the announcement made on 1 May last year, that is), and is not required in Oliver’s full disclosure statement. Could this be because he is, for some reason, one of their recommended candidates? (yes, Nominet recommend candidates to voters rather than rely on an open and fair election). Is he a recommended candidate because they need to keep a representative of the top registrar and a supplier on the Board? Oliver Hope is the Finance and Operations Director at Mesh Digital Limited (wholly owned by Nominet’s largest Registrar in terms of domain name revenue (over £7 million annually) – Host Europe Group (with brands such as 123-Reg, Webfusion, amongst many others). In my view, Oliver’s statement falls short of the required standard. Nominet are recommending a candidate who has not given a full and complete disclosure (as the candidate is from a member and supplier organisation of Nominet). The statement requirements are there for a reason.. so that voters may, at a glance see all the pertinent information about the candidate and have no need to go looking elsewhere. Oliver certainly mentions he works for Domainbox.. however unless you go searching for the specific information about Domainbox being a supplier, you will not find it. When you do, you will notice one announcement from Nominet on 1 May last year. Even the Domainbox website does not mention the fact. Nominet refuse to make the fact of Oliver’s major and significant conflict of interest transparent in the elections, while they were adamant in putting a disclaimer on Oscar O’Connor’s election statement even though it was not required. Double standards? Society in general complains that Government is controlled by big business. In the case of Nominet this is actually proven when taking the weighted voting structure into account. Big business really does control Nominet. Host Europe Group are by far Nominet’s largest registrar and thus gets the most number of votes and thus pretty much controls what happens within .uk. What does this mean in the current election? Whomever Host Europe Group vote for are pretty much guaranteed to get in. I must say that Nominet functions extremely well in running a registry. If you register domains directly with Nominet then you are most likely to have a smooth experience. Everything just works. The staff are polite and knowledgable. We all want a stable Nominet. We all want Nominet to continue with the excellent service it provides. However we must not get disillusioned in the meantime. Bad governance will affect Nominet operations in the long run. As such we should be pushing for good governance, especially if you wish for Nominet to remain out of Government control. Even if you are one of the top 20 Registrars within the Nominet universe, are you happy with most of the power growing and being with the top registrar? Let me give you an example… the results of the direct.uk consultations showed that most of those consulted thought it was a bad idea – how will it actually increase the namespace in it’s current form? – however Nominet still went ahead with the idea. The Nominet Board believed they knew better than the stakeholder community they consulted. This raised questions in my mind. If the decision to go ahead with direct.uk was already decided then the only point of the consultation was to ask how it should be implemented. Who on the Board was pushing for this? Who had the most to gain? Which of the Board members (associated directly or indirectly with the largest registrars) discussed and steered the discussion and decision and which of them recused themselves from this? Nominet have not been forthcoming with such information. The lack of transparency concerns me. It is no secret that I am also a candidate in the current Nominet Board election. I would of course like to be voted in as I believe I can drive the necessary changes in Nominet governance to make it an even better company for members and stakeholders in general. That said, this posting was done as I see a major problem in the way Nominet are trying to get a recommended candidate in. It is supposed to be a transparent organisation, upholding good corporate governance practices and running fair elections. That certainly is not evident.